Logitech's G502 mouse has been our site favorite since...well, since it released way back in 2014. That's a lifetime ago, in hardware terms, and means the G502 is ripe for an update. I had my fingers crossed for a wireless version, maybe even one that would work with Logitech's Powerplay mousepad from last yearâ€”but we're not quite that lucky yet. The G502's getting a new sensor though, along with a few other tweaks. 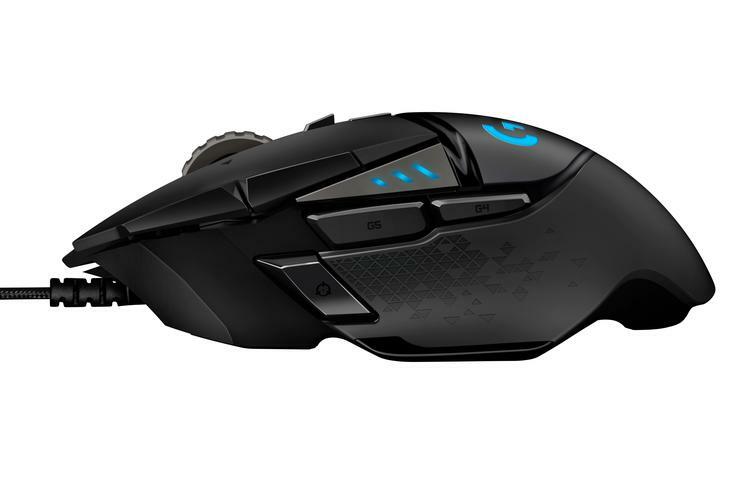 The new version's dubbed the G502 HERO, a nod to Logitech's new flagship HERO (High Efficiency Rated Optical) sensor. The G502 is the first wired mouse we've seen with the HERO sensor, as its low power consumption is mostly beneficial in wireless mice like the G603. That said, HERO matches or exceeds (at least on paper) the specs of the PWM3366, Logitech's previous top-tier sensor and the one used by the previous G502 models. Will anyone notice a difference? Probably not. The PWM3366 boasted pinpoint accurate performance up to 12,000 dpi, which even on a 4K setup is probably higher than anyone needed. The fact that the HERO sensor boasts 16,000 dpi is the mouse equivalent of "going to 11." It's marketing, really. But I'm curious about some of the other changes Logitech's made. For one, there's now a dedicated dpi button on the bottom of the mouse, "to eliminate unintentional in-game DPI shifts." I think that means the G502 gained another button, albeit one that's less accessible. I'm also told the G502 HERO sports an upgraded cable. The old G502 Proteus Spectrum's braided cable was thick, and had a tendency both to kink or pinch over time. Apparently the new model remedies these problems, with a thinner and more flexible braid. Small changes, but hey, it's the best-selling mouse in the world. Even a few tweaks make a big difference with an audience that large. I'm still holding out hope for that Powerplay-enabled G502, but barring that the G502 HERO is worth a look. Don't be surprised if it shows up on our "Best Gaming Mouse" list in the near future.